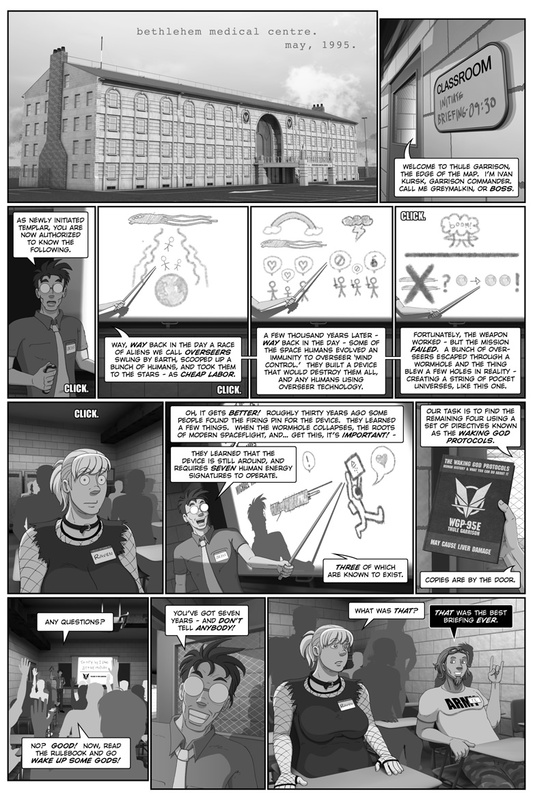 Observer Effect page one – an executive summary of Among The Chosen. It’s a Giant Wall Of Text, it’s Damned Near All The Really Important Backstory, and it’s the first time in nearly ten years and over five hundred pages that a few of the points that Greymalkin makes have been stated clearly. If at all. The fact that he makes these points with crayons speaks to his personality, and his opinion of the WGP. Observer Effect is intended as a ten page introduction to the work as a whole, starting with important conceptual and character histories that are not meaningfully addressed in Dead City Radio or The Dualist – concepts that ATC is built on, and events that are referenced or inferred in the books. As intended, OE should decompress into a lead-in to Dead City Radio, which is why it uses DCR production codes. OE shouldn’t screw with story continuity at all – you don’t need OE to read the story… but if I’m doing this right, it should ultimately give you a really good idea of what you’re getting into. Right now it kinda smacks you upside the head like a Plot Tuna. That’s intentional, and I promise you that the smell will wash off in the shower. The script for this page hit me like a ton of bricks while I was out for a walk a couple of weeks ago – I wrote it down as soon as I got home and while what I intend to do with the rest of OE is still in a bit of flux, most of the script for this page is straight out of my notebook. Though I’ll admit, Greymalkin looked a bit more manic in the thumbnails – a bit like a character in one of Jolly Jack‘s How To Play strips. Pages created from 2010 onwards are typically accompanied by a combination build log and ramble/rant, capped off by a script page and some comments that may or may not be relevant to the page. The utility and value of this metadata is questionable – as such, I intend to do something a bit different with Observer Effect and, when color work resumes, hopefully with chapter two of Transitional Voices. Namely, I’ll be making an attempt to keep the metadata relevant to the contents of the page, as opposed to the production of the page. Plot! I understood this! \o/ Maybe I asked earlier (aaages ago if so), is the candy section coming back? I may reconstitute “Candy” at some point, either as a blog category or by attaching the art assets in question to the relevant Cast entries. The fact that none of the material has aged very well has kept the subject from active consideration. Well… THAT explains a lot. Think I had most of that from DCR, but still, a nice summary. I’ve been reading since… ’05? ’06? Can’t remember. At any rate, keep up the awesome work! 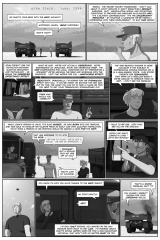 while the making of segments were informative (I am on the ever so slow road to building up a [much softer] SF webcomics myself) I really read them for the plot tidbits. Plot tidbits are awesome. 122 queries in 0.968 seconds.